Solar Energy. Thanks to the generous gift of the B Quest Giving Fund and Benefunder, we have been able to start our work in earnest on the “solar tarp,” or an ultraflexible solar panel that can be balled up and unfurled for off-grid applications. Such applications account for over a thousand Hoover Dam’s worth of carbon emissions globally (mostly in the developing world). In the last month, we have made a discovery in the lab which allows us to make thin films of light-absorbing active materials of much higher quality than has been possible before. We believe that the knowledge we are creating will also make grid-scale printed solar cells more stable against thermal and mechanical insults in the outdoor environment. Our paper on the mechanical robustness of printed thin-film solar cells was published in Solar Energy Materials and Solar Cells. In this paper, we built a robot to bend and twist printed solar modules over tens of thousands of cycles of deformation. We can also use computer modeling to predict where in the device the materials are likely to fail first, and to re-engineer the devices to mitigate this type of failure. This first-of-its-kind project is a collaboration between my group and the group of Frederik Krebs at the Danish Technical University. mohammad alkhadra – runner-up for best poster at the sustainable power and energy summit. Congratulations to Mohammad Alkhadra (BS/MS student) for winning 2nd prize in the poster pitch competition at the UCSD Sustainable Power and Energy Summit on July 18. Mohammad was also the top student in our graduating class of chemical engineering seniors (3.99 GPA, along with several publications from my group, including a co-first author paper in the prestigious journal Chemistry of Materials). This year, our department graduated more chemical engineering BS students than any other program in the US (Georgia Tech was number two). Congratulations to Dr. Laure Kayser (postdoctoral scholar) for winning the grant prize in the poster competition at the 3rd Annual Functional Polymeric Materials conference in Rome. Her work focuses on the synthesis of new transparent conductive electrodes for flexible printed solar cells based on organic and perovskite semiconductors. Laure accepting her award at the functional polymeric materials conference in rome. 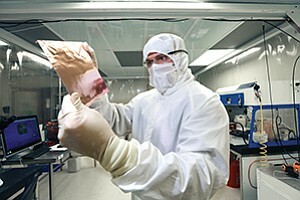 Our project funded by the California Energy Commission on hybrid perovskite solar cells is beginning this summer. The team consists of the research groups of David Fenning (PI), along with me, Shirley Meng, and Bill Torre (co-PIs). The goal is to produce thin-film modules and test them in the UCSD microgrid (UCSD generates all of its own energy, a significant fraction of which is solar). Our project was one of only two funded in California. Wearable Sensors and Cancer Research. Graduate students Julian Ramirez and Daniel Rodriquez travelled to MD Anderson Cancer Center in Houston to test a new device we have invented on human subjects. The device monitors the swallowing activity of head and neck cancer patients following radiation therapy. The device, based on graphene decorated with metal nanoparticles, measures the stretching of the skin and the electrical activity of the swallowing muscles. When combined with a machine-learning algorithm, the devices can automatically distinguish healthy swallows from unhealthy ones and send the data wirelessly to a physician. Julian and Daniel conducted the trial on 14 laryngeal cancer survivors, 7 of whom had developed swallowing dysfunction, and 7 of whom had not. This work represents a milestone in our group, as it is the first human-subject trial for a device we have invented. We are writing up our preliminary results and will submit to a peer-reviewed journal in the coming weeks. Liban jibril – author of the first undergraduate solo-first-author paper from our group! the topic of the paper is single-nanowire strain sensors for wearable sensors and structural health monitoring fabricated by nanoskiving. Congratulations to Liban Jibril for publishing a paper on wearable sensors consisting of individual nanowires as the active elements. This is the first paper from our group to which first-author credit goes solely to an undergraduate. Liban will be joining the PhD program in chemical engineering at Northwestern in September. Organic Haptics. Congratulations to Tim O’Connor, who defended his PhD on August 1st as the fifth PhD graduate of our group. san diego comic con 2017. left to right: jeanne lemaster, chava angell, aaron saunders, robin ihnfeldt, darren lipomi. Outreach. On July 20th, I participated in a panel discussion at Comic Con 2017 entitled “Nanotechnology: Fact or Fiction.” The panel was extraordinarily well attended, with every one of the 300+ seats filled. Alumni News. Aliaksandr Zaretski (PhD 2016) and his spin-out from my group GrollTex, Inc., which last year raised a seed round of $1.2M to commercialize large-area single-layer graphene, was covered on the front page of the San Diego Business Journal. GrollTex reached a milestone in May by selling its first batch of commercial products. alex zaretski, CTO and founder of Grolltex, Inc.
Suchol Savagatrup (PhD 2016), currently a postdoctoral researcher at MIT, won the prestigious postdoctoral fellowship from the National Institutes of Health. Suchol’s fellowship will help him develop a lab-on-a-chip devices to measure cellular trauma as the result of traumatic brain injury (TBI) suffered by soldiers, athletes, and victims of head injuries.